For almost 10 years, Candace Neal has been pairing high school juniors and seniors at Cowan Jr/Sr High School with 1st- and 2nd-grade students at Cowan Elementary School for the Science Buddies program. 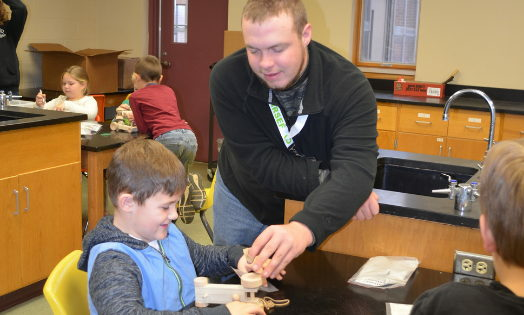 This program, created by Mrs. Neal, allows high school Biology II students to teach elementary students about various scientific concepts through small group interactions and one-on-one mentoring. “We can do about six lessons a year, depending on the lesson and what is on the school’s calendar,” Mrs. Neal explained. Since 2014, many of those lessons have been supported by the Robert P. Bell Education Grant program at The Community Foundation of Muncie and Delaware County. Mrs. Neal has been awarded more than $1,700 in grants from the program. Mrs. Neal’s most recent project funded by a $441 Bell Grant incorporated rubber band racers and the scientific method. First, the wooden cars were built and tested by Biology II students who used the cars to experiment with mass and force using metal washers and rubber bands. The Biology II students then conducted the experiments they designed with their Science Buddies. The rubber band racers will also be used during the 2nd semester by 7th grade Science students in a Physical Science unit. For some of the middle and high school students, their participation in Mrs. Neal’s Science Buddies projects is coming full circle as they were once the elementary buddies years ago. Now, as older students they get the chance to interact with elementary students – an opportunity they wouldn’t otherwise have. During the Science Buddies project to test the rubber band racers, students were divided into six groups each made up of two high school students and three to four elementary students. 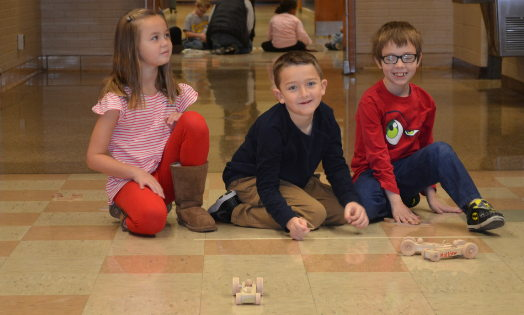 Each elementary student was given their own wooden car powered by a rubber band. The groups spent some time discussing what would happen with the wooden car, and then the groups spread out into the high school’s hallways and gym to have enough room to test their theories. Since the Robert P. Bell Education Grant Program was established in 1992 by the Board of Directors of The Community Foundation, more than $127,000 has been granted to teachers in the Muncie and Delaware County community. Bell Grants provide support for classroom projects that are innovative and creative and designed to stimulate learning, like the Science Buddies lessons at Cowan Community Schools. Robert P. Bell Education Grants are awarded to teachers with innovative ideas, programs, or projects that are designed to stimulate learning in their students. Grants range in size from $50 - $450. Your support to the Robert P. Bell Teacher Grant Fund will give teachers opportunities to enhance classroom learning.